My 500px is a full feature 500px client with upload capability. 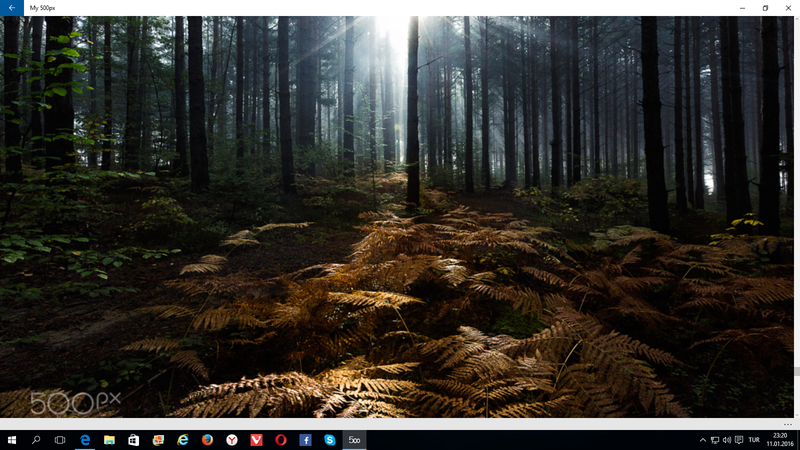 My 500px can update your lock screen/desktop/mobile start screen wallpaper automatically and features 2 live tiles. View your photos and those of any user. Search by keywords or tags. - Upload photos directly from your device. - App live tile will that cycles and update 5 images from any feed of your choice! - My Cycle Tile: Select up to 20 images of your choice to cycle on a live tile. - Wallpaper: Automatically updates lock screen/desktop/mobile start screen wallpaper to feed of your choice. - Save images to your device. - View your photos or those of any user. - Image and data feed cached for quicker browsing. App is free with in-app purchase to remove Advertisement. Just downloaded and tried this now in my PC; it seems like it is some sort of web-wrapper since I am seeing exactly the same layout of buttons that is shown in the website. Is this a real fully-functional app, or is this just another web-wrapper? Update: Thanks to the response of the developer, my initial findings need to be updated. It works as mentioned, just make sure you login fully. A recommended download, considering the official 500px app is long gone from the store. Last edited by gpobernardo; 01-11-2016 at 12:10 PM. Reason: Updated findings. This is a native app, not a web wrapper. Just curious, what buttons are you referring to that are the same? The top menu or navigation bar. It looks exactly like the 500px.com webpage, even the behavior, the loading animations. It's as if I'm viewing it through a browser. I liked it. Waiting for this until official one abandoned. But so much freezing on my L930. Is that my own problem with the app or needs optimization? Do you mean when you are logging in? The login is oauth, which means you log in on 500px.com website which then in returns provides the app with a token which allows it to access your account to like a photo, post a comment, upload a photo etc. This way you don't provide the app with your actual password. Are you using the app on a cell connection or wifi? On cell connection or slower connection it, it may run slow as it downloads the images which are high quality. I will be looking at adding a setting which you can have the app use lower resolution when on a cell connection. In addition I will be looking at optimizing the image loading if possible. I'm using Wi-Fi. At any rate, my cellular connection is faster than my Wi-Fi. I must mention that I tried logging into my 500px account, and that's when I started seeing the webpage-looking layout. If I were to just browse for, say, "Upcoming" photos without logging in, the app doesn't show the browser-like interface. Of course the log-in page is standard and will resemble the one that is in the web, but even after logging in the app loaded the main landing page that is the same page shown in the browser. When you login, you need to tap on Authorize app. Once you do that, it will close the 500px site which you logged in on and return to the app. You are browsing from the login page. Thanks. I'll update my first response here. I am using Wi-Fi. (16mb) And now I tried it on desktop, same and having problem with size. It's not fit well on screen. It shouldn't be freezing up. Can you give me more information on size issue, how it doesn't fit? Can you provide screenshots? Excuse me for duplicated messages. It wasn't visible. Last edited by Eurx; 01-11-2016 at 03:46 PM. The image resolution is maxed at 1080 pixels on longest edge, so when you go full screen the image will be stretched. The API allows to retrieve a max size of 2048 pixels on longest edge but I think performance would be effected when downloading images that large, on mobile its even worse at that. Having said that, I will be looking at adding settings to choose the image size to download for viewing for mobile and for desktop. When saving the image to your device, it already downloads at max size. Yeah download option is works good. Thanks for attention. - Added number of photos you have left for upload and notice of when you can upload again if limit reached. - Minor UI enhancements and bug fixes. - Main page loading improved. I've just installed the app and I can't find it on my list of apps on the Start menu. I now it's installed because I can open it from the "Open" button on the Windows Store app. Could anybody tell me what happened and how to fix it? I'd like to update my previous message. I can find the app if I go to Settings ==> System ==> Applications and features. That means that in theory I can uninstall it. I just can't find it on my list of apps and neither can Cortana find it on my computer. Why is my screen dimming all the way after upgrading to Windows 10? Launching from the start menu and non responsive apps. Cant buy apps in windows 10 store (PC) with microsoft account. Horizontal scrolling for e-mails on my PC (Windows 10), where is it?